The Minnesota Twins love their baseball, and nearly every season they field a team that challenges for a playoff berth. Many teams around the league are amazed at the way that Minnesota can consistently play winning baseball without one of the larger payrolls in the league. Led by Joe Mauer, the Twins play with heart, dedication, and passion. Show your Twins team spirit with some officially licensed Major League Baseball apparel. Are you a fan who needs larger sizes, but can't seem to find the bigger sizes you need? We carry sizes 2X, 3X, 4X, 5X, 6X, XLT, 2XT, 3XT, 4XT, and 5XT. Most of the sports apparel stores that you will find, will only carry sizes up to a 2XL. This can be frustrating for die hard baseball fans who need larger sizes! Dress and feel like a real pro! Made by Majestic Sports Apparel (MLB's official apparel suppler). Sizes Available : 2xl, 3xl, 4xl, 5xl, 6xl, xlt, 2xt, 3xt, 4xt, 5xt. Joe Mauer is the heart and soul of the Twins offense. He has the ability to win batting titles and be a continual force in their lineup for many years to come. 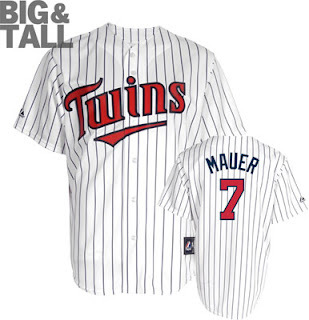 If you are a fan of Joe Mauer and need larger sizes, this is the jersey for you. 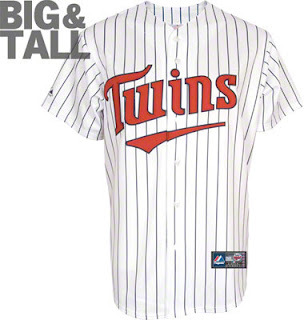 We also carry big and tall Minnesota Twins Sweatshirts, Jackets, and T-Shirts as well!